Mr. Cox secured "The Sun" also from the Klamath Indian (see Owl's Net). First and Second: The same as the First and Second movements of the "Rabbit." Third: Pass each thumb from below up between the lower index loop and the little finger loop and draw toward you, on the back of the thumb, both strings of the lower index loop (Fig. 174, Right hand). Fourth: The same as the Fourth movement of the "Rabbit" (Figs. 174, Left hand; 175, 176). Fifth: Release the loops from the little fingers. 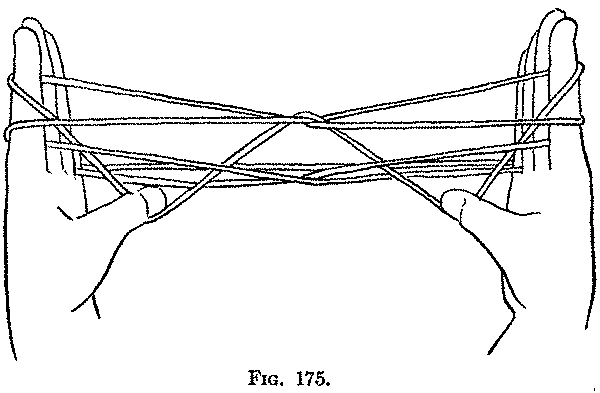 Sixth: Insert the middle, ring and little fingers of each hand toward you (from above) into the thumb loop (Fig. 177) and withdraw the thumb. Seventh: Pass the thumb from below into the upper index loop in order to make this loop wider. Bend each middle finger down toward you over the upper far index string and both strings of the lower index loop (Fig. 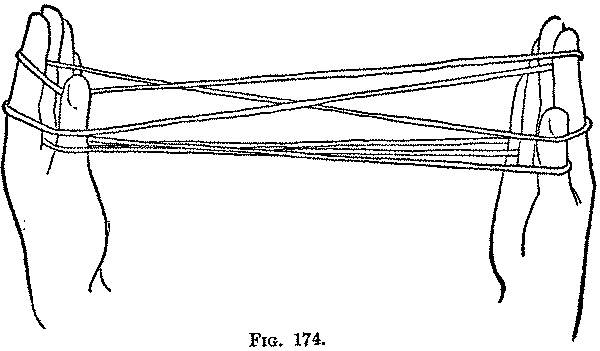 178) and draw these strings down to the palm. Withdraw the ring and little fingers of each hand from the loop which they have been holding and bend them toward you and down over the strings held down by the middle finger. 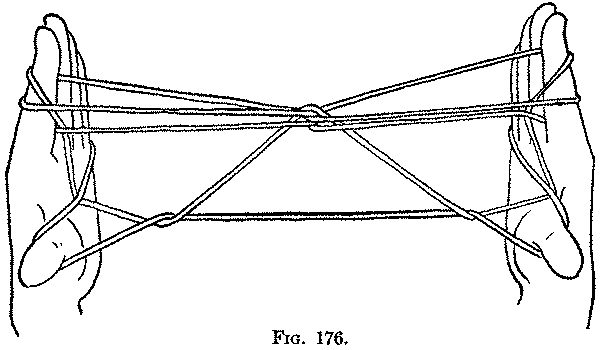 Eighth: The "Sun" is made to appear by raising each thumb, thus lifting up the near index string which passes across its back (Fig. 179); if raised too high, the sun "sets" (Fig. 180). ex T up and sun rises & "sets"